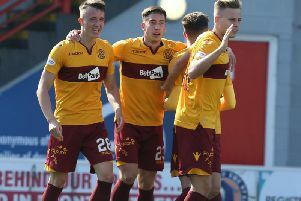 Motherwell assistant manager Keith Lasley has revealed that midfielder Craig Tanner – crocked for the past eight months since suffering a freak training ground injury – still faces a while out of competitive action, writes Craig Goldthorp. The 24-year-old former Reading player suffered a dislocated kneecap back in March and has been under the knife twice since to delay his anticipated comeback. Lasley said: “Tanner will still be out for a bit of time. “It’s a real sore one. “He’s back, he’s down at the training ground and done bits of running and things like that. “But he’s still a bit away and it will be certainly after the January break before he comes back. “He has been a big miss for us. I think Craig had a really big impact for us last year. “He is somebody who can kind of unlock in the final third. “He’s got that final pass, a setplay or something in that area of the pitch. “He can obviously score himself as well. And the national press reported on Wednesday that Tanner's fellow midfielder Chris Cadden faces four months out injured after sustaining a torn patella in the 7-1 loss to Rangers at Ibrox on November 11.